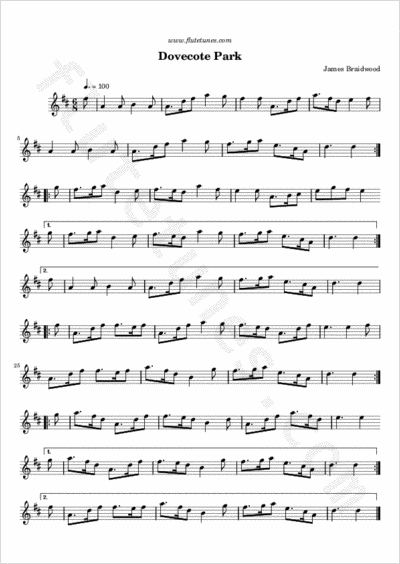 This popular Scottish march was composed by Pipe Major James Braidwood, and appears in many collections for Highland bagpipes. Braidwood lived in Edinburgh, and was a friend of Pipe Major William Ross. When Willie was, rather suddenly, appointed to the Army Class in 1919, he didn't have accommodation in the city, and Jimmy Braidwood put him up at his house, which was called Dovecote Park. He also composed a tune in his honor, which he titled “Pipe Major William Ross's Welcome to Dovecote Park”. Ross enjoyed the tune and included it in his collection, but modestly deleted references to himself in the title, publishing it only as “Dovecote Park”. The tune is sometimes called “MacDonald of Sleat” after a dance of that name which uses the tune.